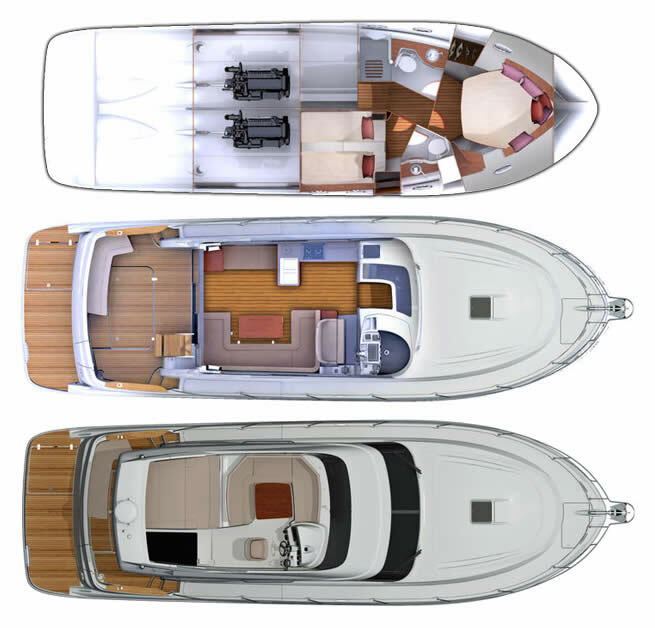 The Antares 42 hull has been designed by the BENETEAU powerboat design office, whose know-how is now wellestablished and has widely proved a tremendous success with boaters. Some interesting statistics to remember that illustrate this know-how: There are more than 15,500 Antares sailing the seas and oceans, and the Antares 42 will be the forty-ninth Antares model designed by Beneteau. Optimisation of the weight/power output and therefore controlled fuel consumption. Remarkable stability at sea (thanks to an optimised waterline beam, added to which is the effect of the transom being slightly reversed where it attaches to the hull, as well as a 15° V shape aft. It goes through the water beautifully thanks to a fine entry at the bow and a very ‘tulip’ shape to the hull topsides. This gives effective protection in all sea states. 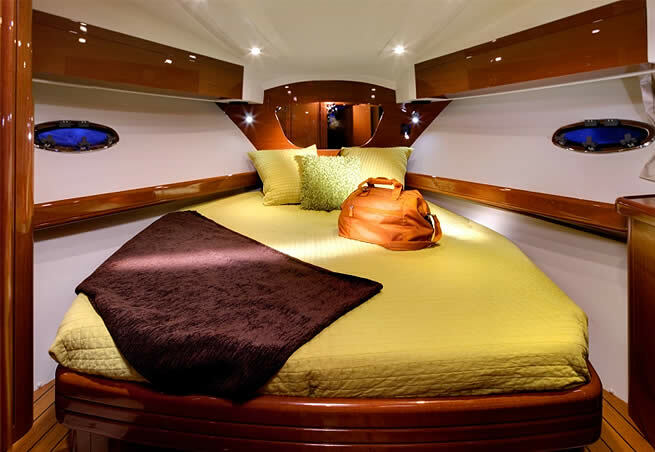 The Sarrazin Design designers bring to the Antares 42 its stretched, elegant lines. 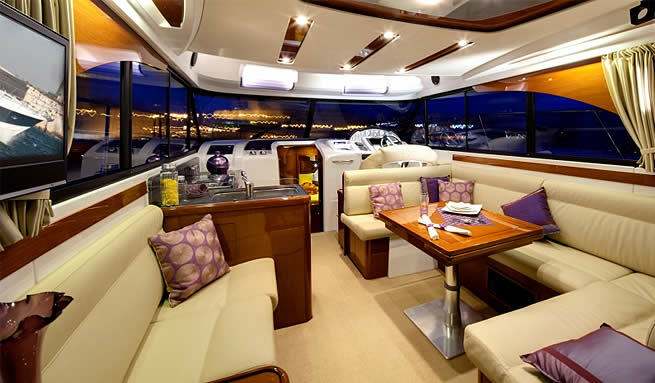 In this way they are able to create an attractive harmony between the hull and deck lines and where these connect with the flybridge. positioning of all the navigation electronics, etc. an exterior saloon, whose capacity is one of its other strong points (U-shaped saloon with table). It is a real “terrace with a sea view”. * Maximum speed varies according to the load on board. This is by means of a triple sliding door, making it easier to move around, and giving an increased feeling of well being (ventilation, exterior vision). The Antares 42 has two cabins with heads compartments, one of which is fitted with a separate shower for greater comfort for those on board. 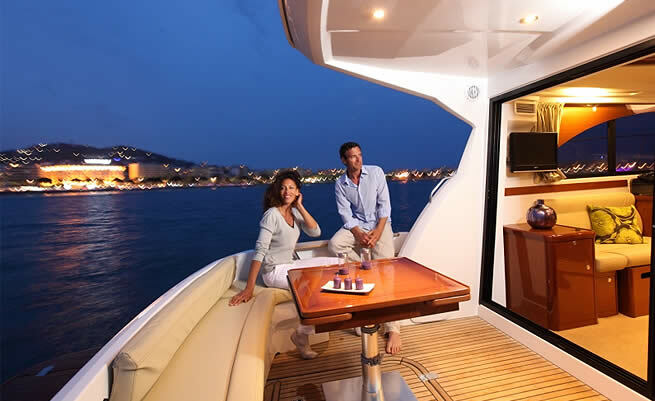 The saloon can be converted to give two additional extra berths. The L-shaped galley is fitted with generous stowage for optimal life on board. 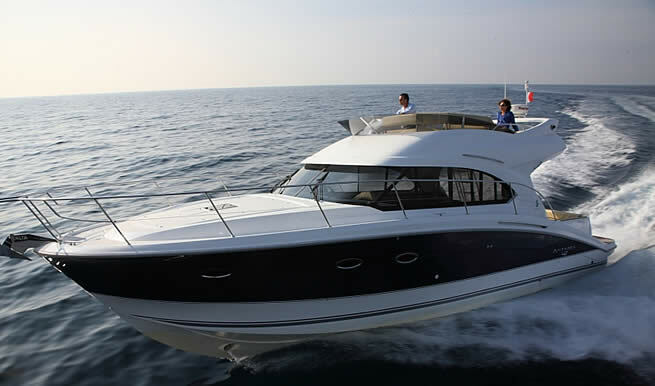 The Antares 42 is a “sharing” boat - not just to share the pleasure of living on board but also to share navigation. The driving position has a large bench seat that takes two people. The large bathing platform at the stern of the Antares 42 has been well thought out to enjoy swimming. (1.25m x 4m, it accommodates the bathing ladder, a shower, access gate aft, wet locker etc). This bathing platform also provides a very safe access to the boat when in harbour.